More photos of great things we just brought in for sale at Exit 55 Antiques in Fergus Falls, MN, that I just love. 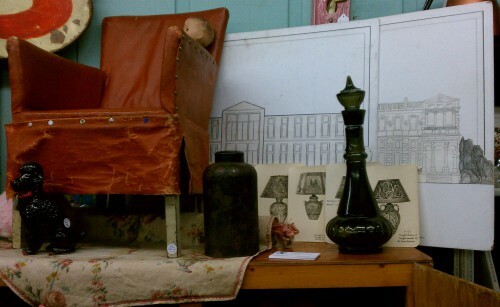 The feature of this little set-up is the antique child’s chair. Details on the chair can be found here. Other special pieces include the antique doily holder, a ceramic black poodle bank, a smokey-colored glass decanter, a floral tin, catalog or salesman’s cards for Italian lamps, and those theatre pieces from a production of The Nerd. As always, if interested in anything shown here you can contact us here; call me, Deanna, directly at (701) 306-6145; or call the shop directly at (218) 998-3088. And keep an eye on our Facebook page for more photos of our antiques and collectibles.